Product prices and availability are accurate as of 2019-04-10 00:20:19 EDT and are subject to change. Any price and availability information displayed on http://www.amazon.com/ at the time of purchase will apply to the purchase of this product. Add a classic style to any room in your home with this lovely Amora Lighting Tiffany-style floor lamp. This beautiful light fixture includes 144 glass pieces and 12 beads to add luxury and style to your home. 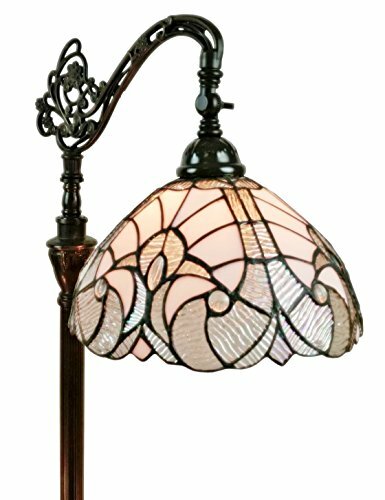 Handcrafted using the same techniques that were developed by Louis Comfort Tiffany in the early 1900s, this beautiful Tiffany-style piece contains hand-cut pieces of stained glass, each wrapped in fine copper foil.Includes: One (1) LampSetting: IndoorColor shade: White opaque stained glass with fewer stains in top of the shade and Clear White Glass with irridescents on the borders.Fixture finish: Dark brown,Adjustable shade 144Glass pieces and 12 beadsNumber of lights: One (1) lightRequires: 1 E27 Type A bulb x 60 watt (not included)Switch type: Floor switchLight bulb type: IncandescentBulb wattage: 60 WUL listed Material: Art glass, metalLight direction: DownlightLighting style: TiffanyColor: White shade, brown baseDimensions: 11 inch diameter x 62 inches high, Shade depth: 6 inches deepNote: Shade colors will appear darker and less vibrant when not illuminated. This stained glass product has been protected with mineral oil as part of the finishing process. Please use a soft dry cloth to remove any excess oil. Attention California residents: This product contains lead, a chemical known to the state of California to cause cancer and birth defects or other reproductive harm.